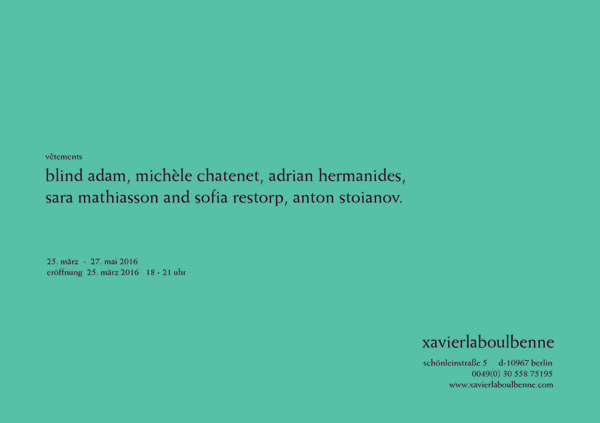 BLIND ADAM, MICHÈLE CHATENET, ADRIAN HERMANIDES, SARA MATHIASSON and SOFIA RESTORP, ANTON STOIANOV. Reworking and eventually breaking through dualism appears to be the key to “new materialism”. 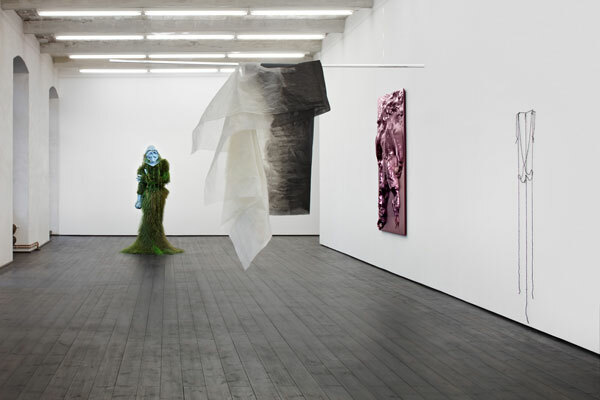 In this exhibition, six artists dissolve the division between matter and discourse, applying human narrative to defunctionalised objects and techniques, while avoiding the binary opposition of function / non-function. In each work the motif of clothing is present but rendered both useless and sometimes even unidentifiable. This exhibition proposes a productive exploration of the incestuous relationship between two disciplines that is not the instrumentalisation of Art by a mighty industry but the acknowledgment of fashion as a proactive sociological revelator, even when unwearable. Thanos Kyriakides aka Blind Adam created traces of vestments made with sparse wool threads, capturing the essential, if not sketched ideas of Antic attires. Adrian Hermanides’ structural shelf displays clothing item dipped in mud, the mangled and solidified fabric taking visceral abstract forms, utilitarian design is here a shadow of itself. Anton Stoianov' biking leather suit embodies the heroic figure in all its sartorial and pictorial splendor. The gallery is open from Wednesday to Saturday, from 2 to 6 pm during the length of the exhibition.